New Delhi: With the Narendra Modi government completing two years of its rule at the Centre, Union Health Minister J.P. Nadda said he aims at covering children who are either unvaccinated or partially vaccinated against seven deadly diseases by 2020 under ‘Mission Indradhanush’ for a healthy India. 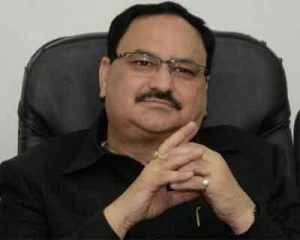 Nadda said his ministry intends to wipe out diseases like diphtheria, whooping cough, tetanus, polio, tuberculosis, measles and hepatitis B. “During my incumbency, I have made sure that the health department as a whole is given due consideration and the issues related to it are properly addressed. We have tried to make major improvements on all fronts. In public health department, the greatest achievement has been the immunisation program,” he told ANI. “As we all know, approximately 90 lakh children are left out of the purview of the immunisation, out of which 20 lakh were partially immunised. Keeping that in mind, we started Mission Indradhanush in 2014, under which we have had three phases till now. In the first two phases we managed to cover 201 districts and 297 districts respectively,” he added. In the meantime, he also talked about the India Newborn Action Plan (INAP), which was launched in September 2014, with an aim of ending preventable newborn deaths and stillbirths by 2030. “In addition, this year, we have added two new programmes, including ‘National Dialysis programme’, which aims to help poor patients suffering from renal (kidney) disease and require regular dialysis; and introducing six new AIIMS (ALL India Institute of Medical Sciences) in the country to give a push to the tertiary health care,” he said.